100 years ago, Tibbetts Brook meandered it's way through the Bronx wetlands, sustaining an enormous ecosystem on the edge of the booming industry of Manhattan. As the city began to stretch and grow, development to the north of the city was needed, and the wetlands were paved over. Water flowing into the estuary was dammed in Van Cortlandt Lake, and Tibbetts Brook was buried into the Broadway sewer. Today, this "simple solution" has become the leading cause of pollution in the Harlem River due to sewer overflow. In addition to water pollution, flooding plagues Marble Hill and the neighborhoods surrounding Van Cortlandt Park, further splintered by a century of poor urban planning which has fractured and isolated this area of the Bronx. Through Daylighting Tibbetts Brook, a constellation of artist and designer- led initiatives in the Bronx, City as Living Laboratory is calling attention to the solution: unearthing this buried stream and channeling it along an abandoned railroad line directly into the Harlem River. This will allow the clean, fresh water of Tibbetts Brook to bypass the sewer system, collect excess rainwater, and create a beautiful new linear park with walking trails and bike paths that will join the new greenway planned to connect Van Cortlandt Park to the High Bridge. CALL began this exploration through a series of WALKS and WORKSHOPS in the neighborhood, starting in 2014. 2018 saw the launch of the first two projects, aimed at building public awareness, encouraging local residents to begin to envision a greener, more sustainable Bronx. CALL aims to build on the momentum of these projects to roll out more community workshops in 2019 which will inform designs for the rebirthing of Tibbetts Brook. A map showing the original course of Tibbetts Brook before it was paved over and funnelled into the Broadway Sewer a century ago, layered over a current street map, and the proposed new route for the brook along the abandoned CSX rail line. FINDING TIBBETTS by Amanda Schachter & Alexander Levi of SLO Architecture is an innovative, demonstration project and public engagement initiative focused on the long-term goal of daylighting the buried stream which accounts for the largest combined sewer overflows (CSOs) into the Harlem River. 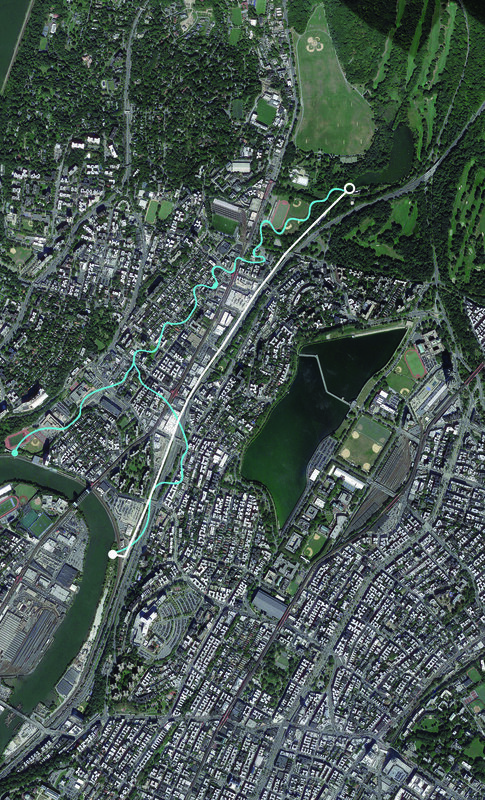 It will draw attention to how daylighting the brook will substantially improve the condition of the Harlem River and provide a host of other health and environmental advantages. SLO has proposed a micro wetlands on a mobile truck bed to be displayed at a variety of sites from Van Cortland Lake to the Harlem River in view of or adjacent to the proposed course for daylighting – the abandoned CSX rail-bed. Constructed over summer 2018, this project is currently touring the Bronx. Estuary Tattoos by artist Bob Braine coincides with the launch of SLO’s “pop-up wetland”. These body-painting events have been conceived in collaboration with ecologists and biologists, providing as a platform to explore the parallels between the human circulatory system with that of regional wetland ecology. In 2016, Braine carried out a similar series of events in Freisland, Germany translating the vast expanse of the Wadden estuary, which is only visible from the air, into vivid diagrams that evoked its hidden beauty, dynamic and nourishing circulation. By making Bronx residents themselves into works of art, Braine will help them visualize and understand the estuary on a visceral level. The temporary ‘tattoos’ will be documented in still photographs and will be displayed at public outdoor sites near or around Van Cortlandt Park and/or the Lehman College Galleries.